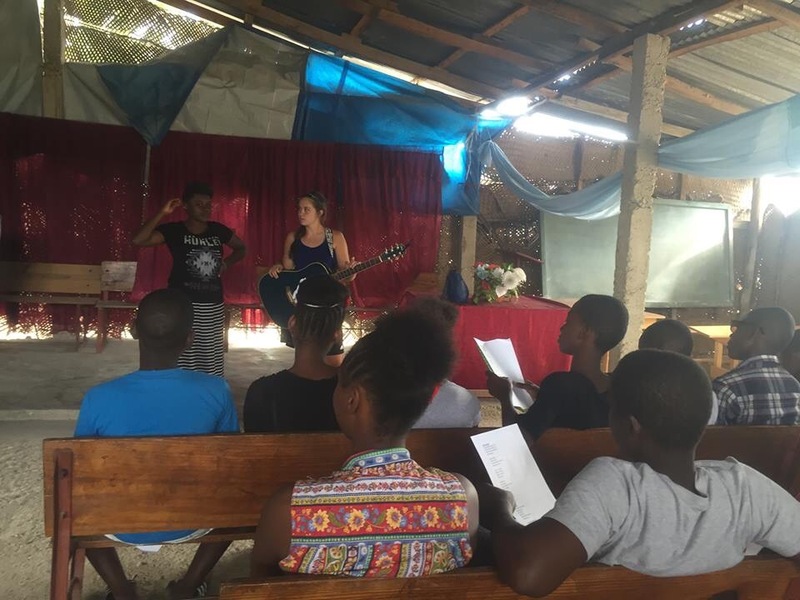 A few weeks before we came to Haiti in December, I was contacted by Dennis Mckee of GAP Ministries and I was asked if I would be willing to teach music to a Haitian youth group in Montrouis(pronounced: mōwee). Montrouis is a little over an hour from where we live. The youth group is led by Diesmy Garcon who also works with GAP. I was a little nervous about doing it, but I really felt like it was a huge ministry opportunity that God was giving me, so I agreed to do it. I talked with Diesmy when we got to Haiti to figure out what exactly I was going to do because as far as I knew, I was just “teaching music”. I didn’t really know what that entailed. He said they had five guitars at his church and he wanted me to teach guitar and to teach them some worship songs. So basically, he is wanting to raise up new worship leaders for his church through his youth group. Isn’t that awesome?! So far we’ve been having lessons for two weeks now. We do it on Saturdays for a couple of hours. I really didn’t know what to expect when we started this, but the kids are amazing! 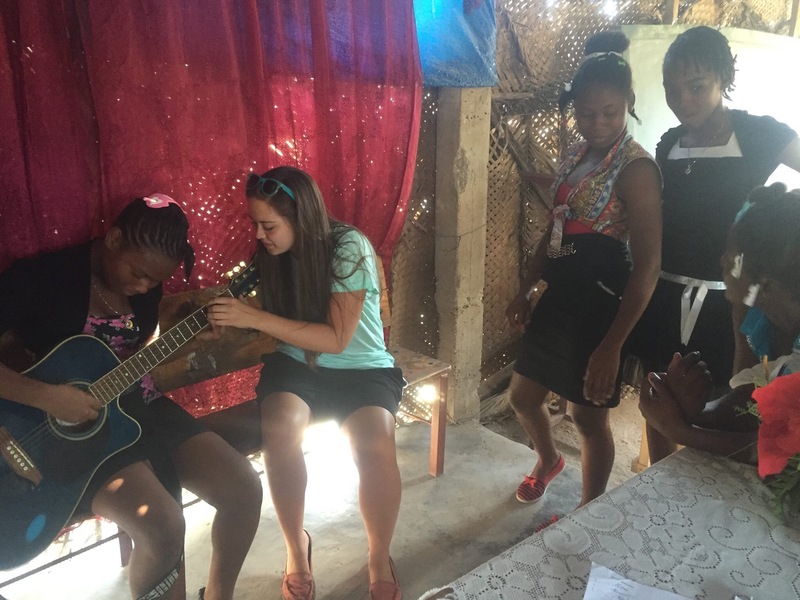 We started out learning Give Me Jesus so they could learn a song in English and they learned it so fast! Through my great friend and translator, Loveline, I explained to them what the song was about and their eyes lit up and they said, “wow, this is a great song!”. We started guitar last week and they really seemed to enjoy that. 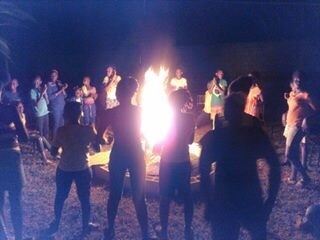 Please keep this youth group in your prayers as they continue to learn how to lead others into worship. Also for me, that I would continue to follow the guidance of the Holy Spirit as He’s given me this platform to teach what I’ve learned about music and to share what God has done in my life through music. Praise God for such a wonderful oppotunity! Milna did a wonderful job! I wouldn’t be able to do any of this without my great friend and translator, Loveline! Last week we had the opportunity to be a part of a dedication for a water pump that will be free for a community in Borel. It was an awesome experience to be a part of this dedication. 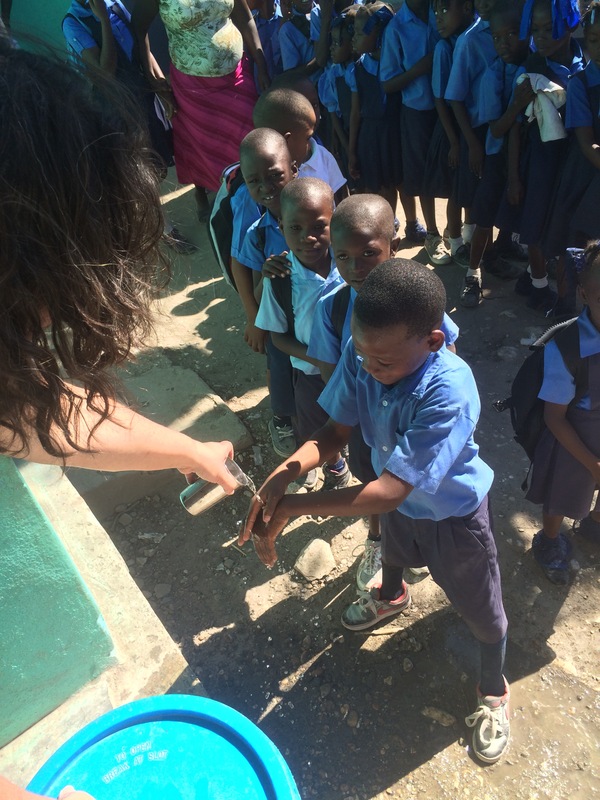 There was lots of laughing and dancing and praising God for this gift of clean water. Thank you Ben for giving back to your community. May all the glory always go back to God! Yesterday (Tuesday), we had the opportunity to visit a school down the road from where we live. Our friend Fritz works there. He asked if we would come during the time that the kids were eating lunch so we could help serve. 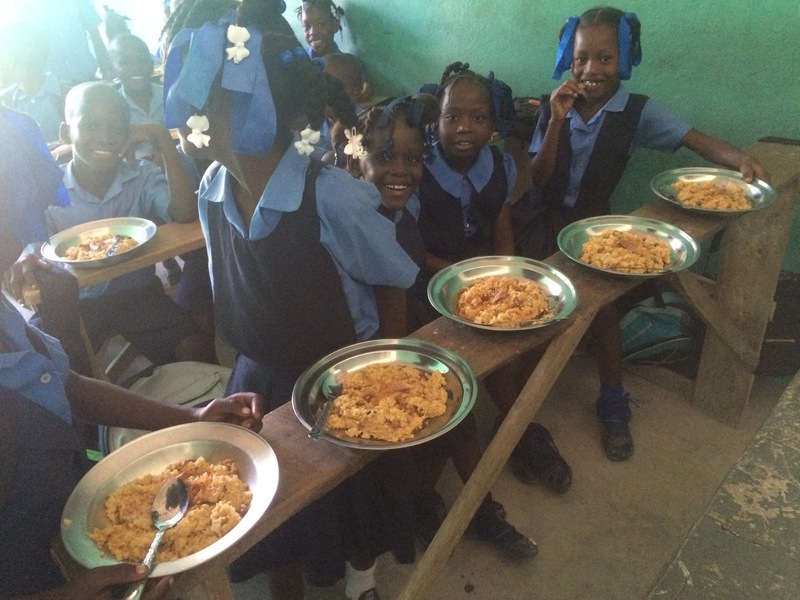 Take a look at these pictures; lunch is a little bit different procedure than how we do in American schools. Washing their hands before they get their rice. This guy was loving the camera! Waiting patiently in line for lunch. We were walking around to different classrooms and visiting with the kids while they were eating lunch and I went over to see the 2nd grade class. Fritz teaches the 2nd grade class and he was helping serve food so there were no adults in there with the kids. I walked into the classroom with my camera and I was taking some pictures of them and they were smiling and laughing and having a great time. But then one of the second graders got all of the kid’s attention, and they all got really serious and sat down in their seats. I wasn’t sure what was going on until I continued to watch. 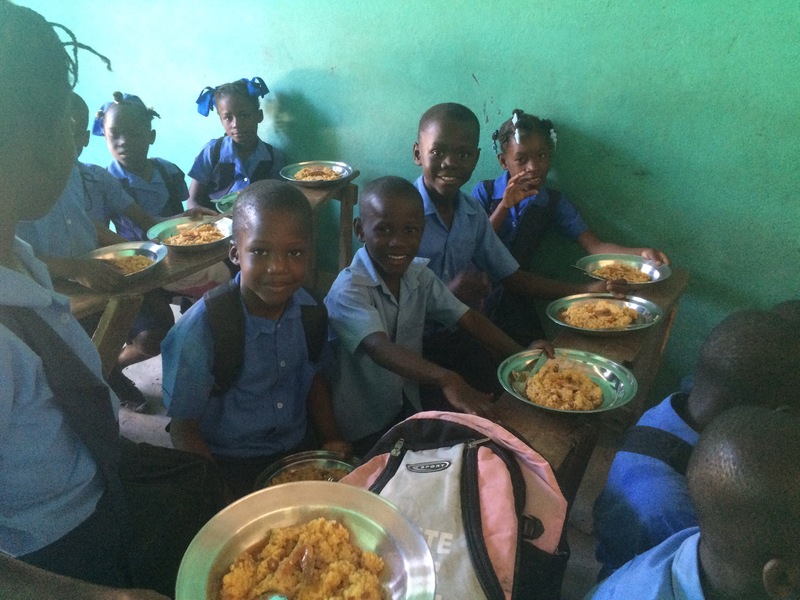 They all sat down, bowed their heads, and thanked the Lord for their food… Second graders. With no adult supervision. It would’ve been so easy for them to skip that part and to keep smiling for the “blan” taking pictures, or to just start chowing down on their food. Priorities, man.. Most of you who are reading this probably just finished eating something for lunch. Say a prayer and thank the Lord for giving you something to eat today, and also say a prayer for the many people who are without food today. 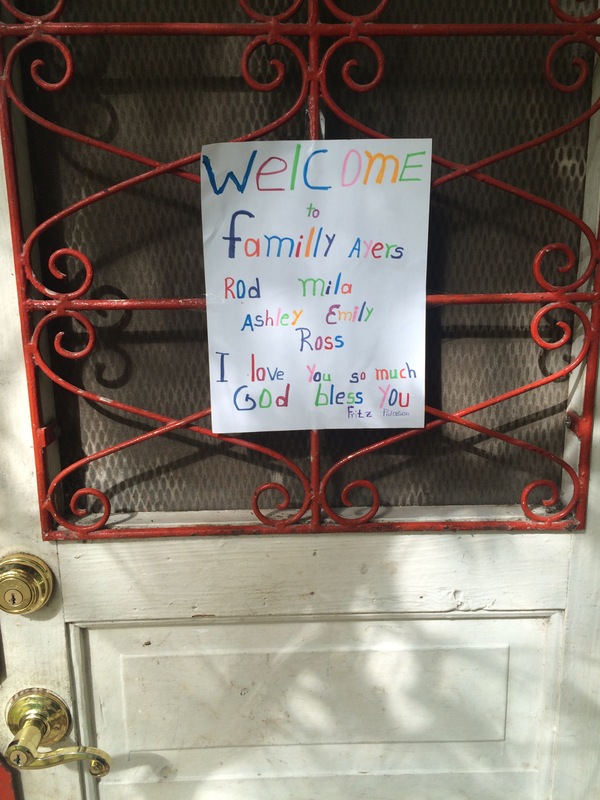 Our family has been in Haiti since Christmas day, about 3 weeks. We brought a team of 11 with us and they stayed until January 1st. Sharing pictures helps me remember everything we did, so I’ll share some pictures with captions. P.S. 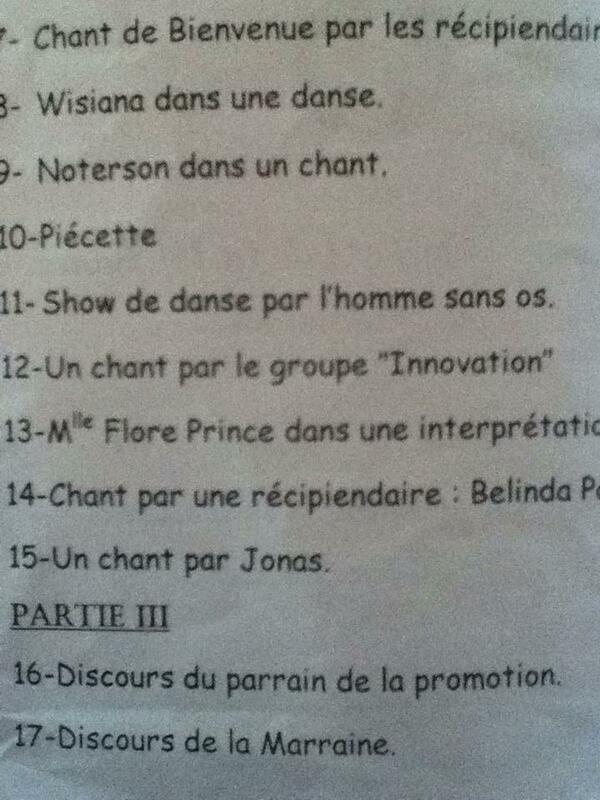 I don’t remember the exact order of when we did everything, so the pictures are in random order. We had the opportunity to visit Karen’s orphanage down the road in Dechappelle. It was our first time visiting the orphanage and it was such a fun time! We brought instruments and played some worship songs with the kids and we went for a walk down the canal. It’s become an annual tradition of helping Guivens have a Christmas party for his Little Seeds of Faith group. 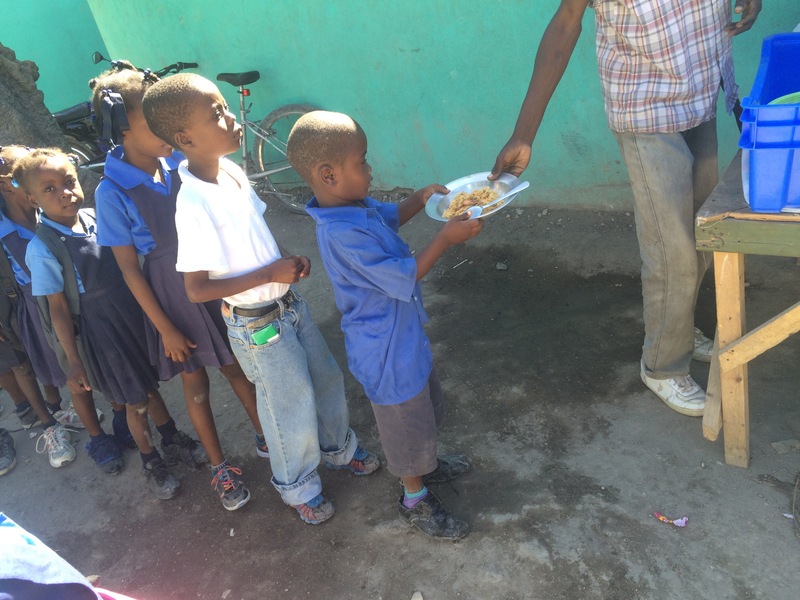 And of course, we can’t bring a team to Haiti without taking them to see the muffin man! These guys always love having visitors. Especially when the visitors give them good business. These muffins are some of the best muffins I have ever tasted! Our “mountain day”. 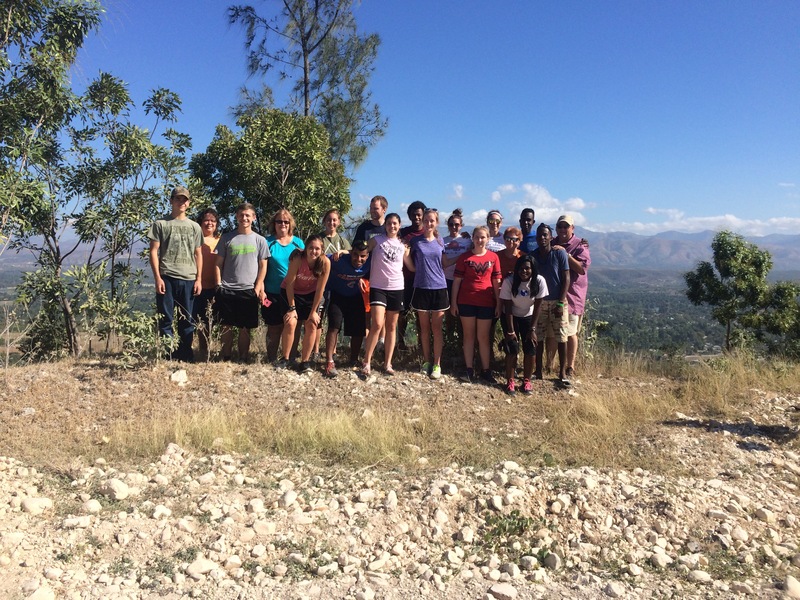 Stopped here to take a team picture with the Artibonite Valley in the background. 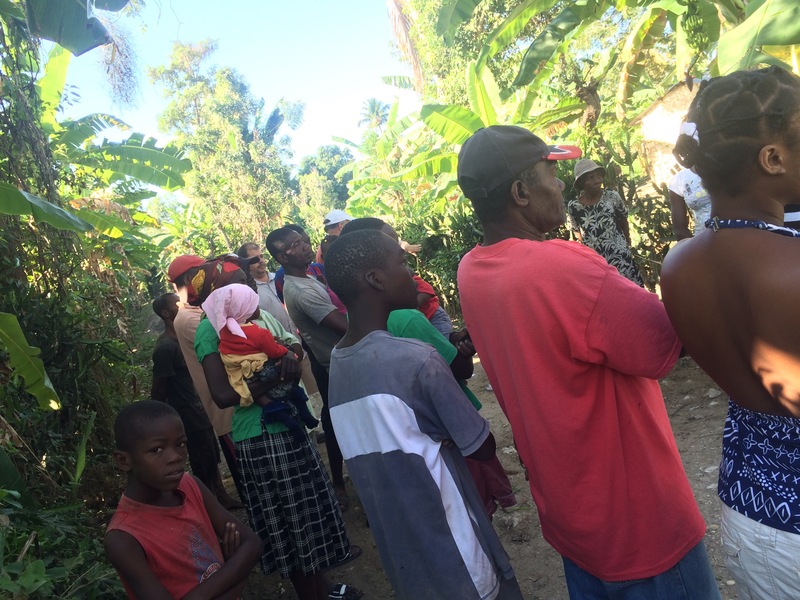 We walked around and visited different Haitian homes and prayed with the residents. At this home in particular, God gave us the opportunity to present the Gospel to this family and many other neighbors who came to listen. 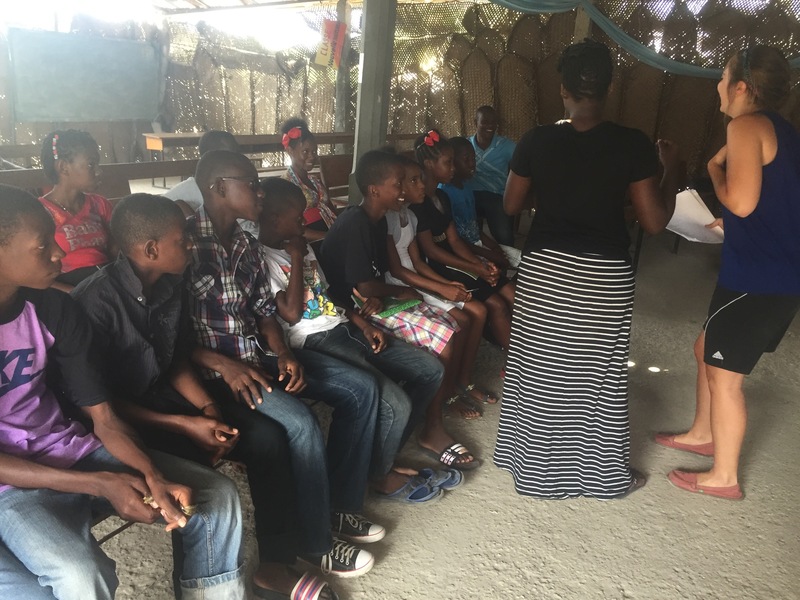 We gave them a Haitian Creole Bible and prayed over them. These little girls in the picture didn’t have any clothes, so (thanks to all of you who donated clothing and supplies for our trip) we gave them each a dress. 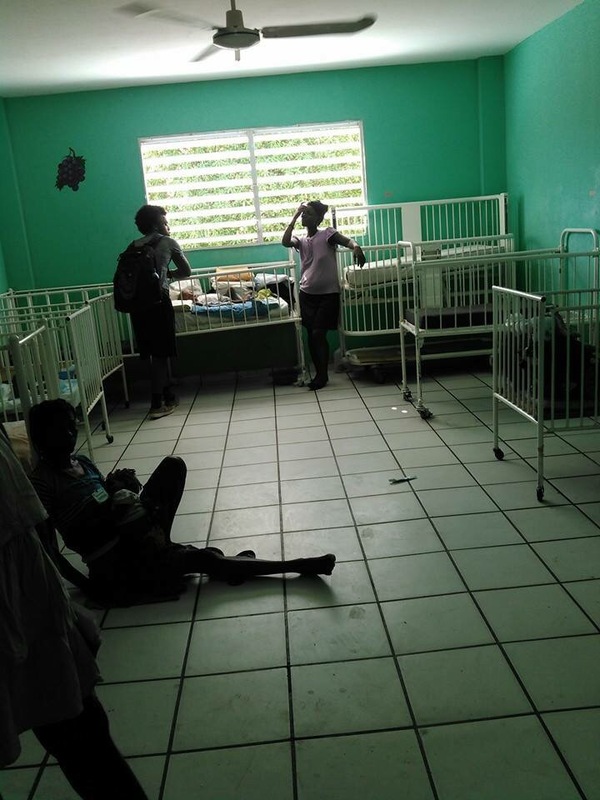 As you can see, the conditions of this Haitian hospital are very different from what we’re used to in America. 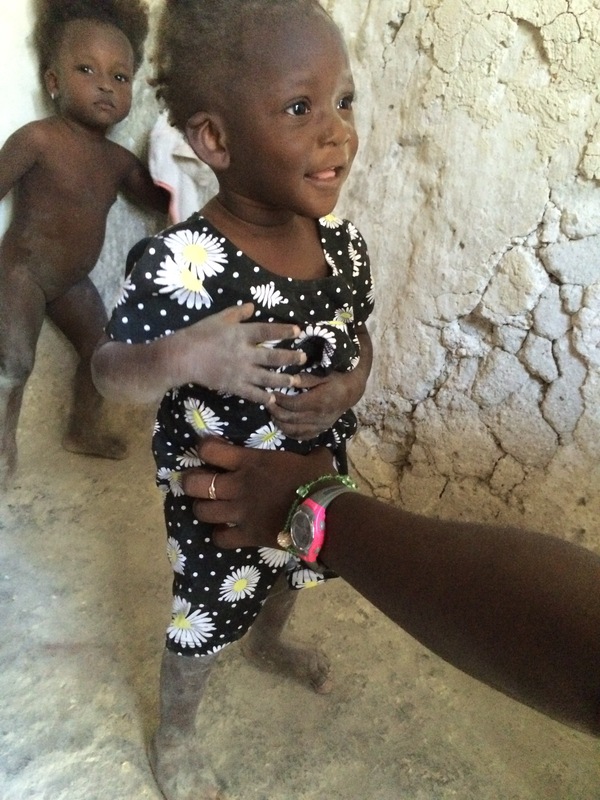 We try to make it a point to visit a hospital every time we come to Haiti. We usually take Bibles, some hygiene kits, and sometimes granola bars. The patients are extremely grateful for the prayers we offer. God does a mighty work through this ministry. 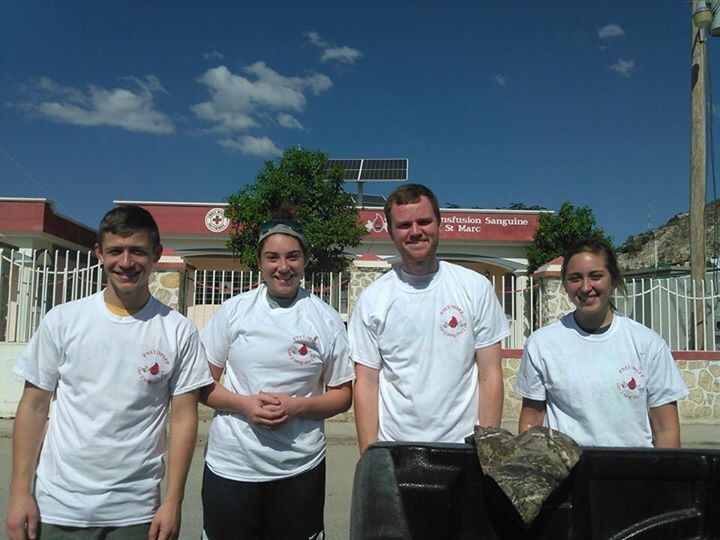 (L-R: Alex, Sadie, Matt, and Ashley) These four people here are some very brave people 😉 Right behind them is the Haitian “Red Cross” . We learned a couple years ago that we can go here to donate blood. So, getting stuck with a needle the size of a toothpick, these guys generously donated their blood. As you can see, they got some free T-shirts and also free snacks after it was over! This little cutie here is Guesley. He is the Compassion Child of a friends of ours from Hannibal, Jonathan William. 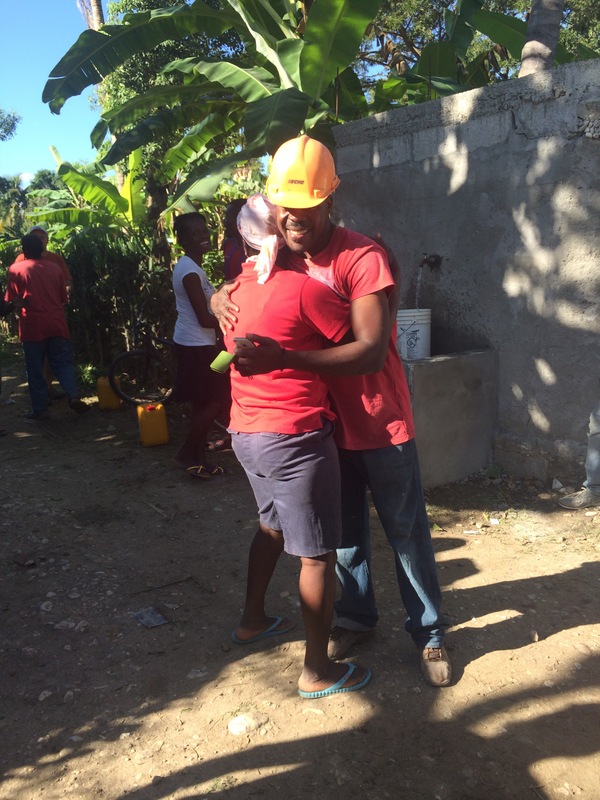 Jonathan had the opportunity to join us on our last trip to Haiti in June 2015. He got to meet Guesley in person and get to know his family. Guesley only lives a short walk away from our compound so it was an easy walk to his house. 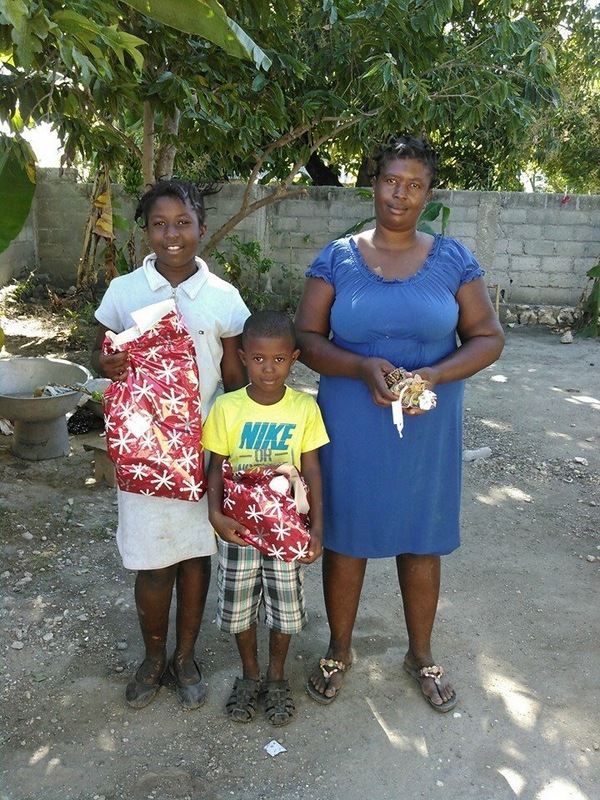 Jonathan sent a suitcase full of goodies for Guesley and his family to enjoy for Christmas. They we SO grateful. Guesley especially loved the soccer ball and the pictures Jonathan sent him. Guesley’s brother told us that Guesley prays for Jonathan everyday. Sponsorship is such a blessing!! Anyways, it was a blessing to get to work with the people on our team this trip! It’s always amazing to see how God puts our teams together. We got to reunite with some friends from different home towns through this trip, so that was pretty awesome too. My sister, Annie, and Alex all stayed for another week after our team left. 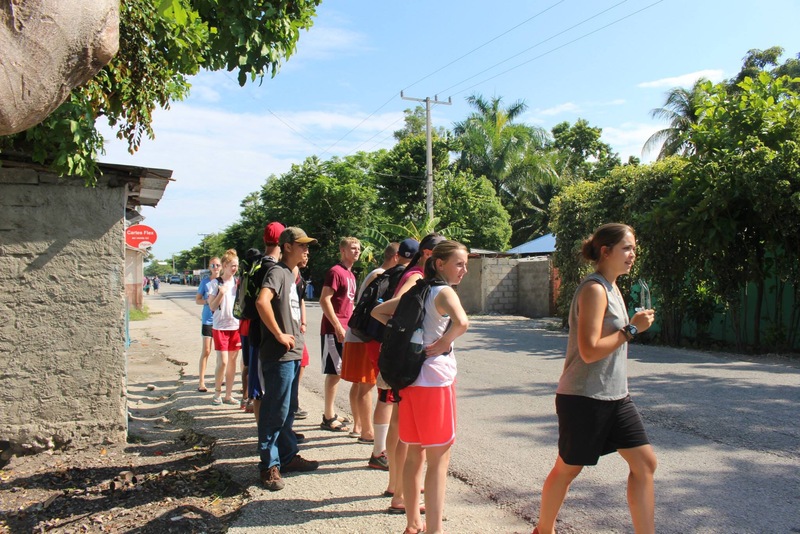 We had lots of opportunities to visit with people in the community and to pray with them and pass out Bibles. It’s always great to get to know the community better and to form relationships with people. This past week, we worked with the College First team from Findley, Ohio. 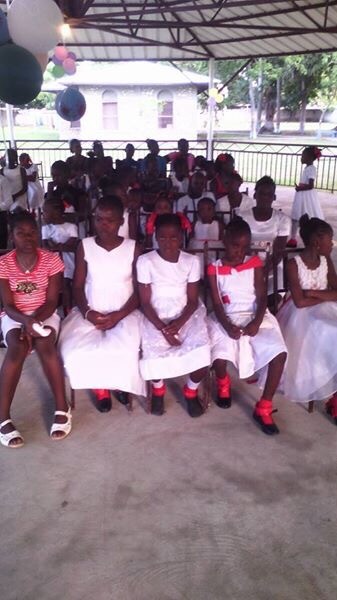 They built benches for the school at Savon Tapion and visited their sister church at Charette. They were a great team to work with and I can’t wait to work with them again! (Si Bondye vle: if God wants) We said goodbye to this team yesterday at noon. We appreciate all the prayers you are sending up for us! Keep ’em coming! 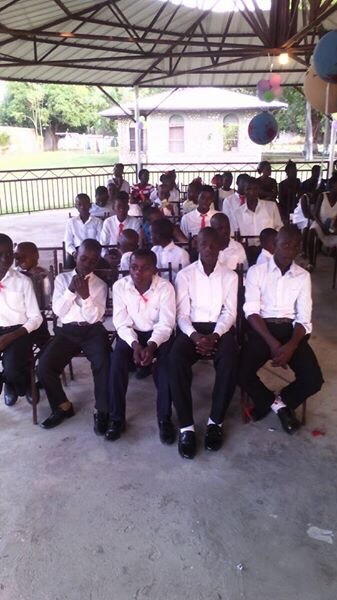 We see God doing amazing things in the lives of our Haitian friends and in our own lives as well. To God be the glory! 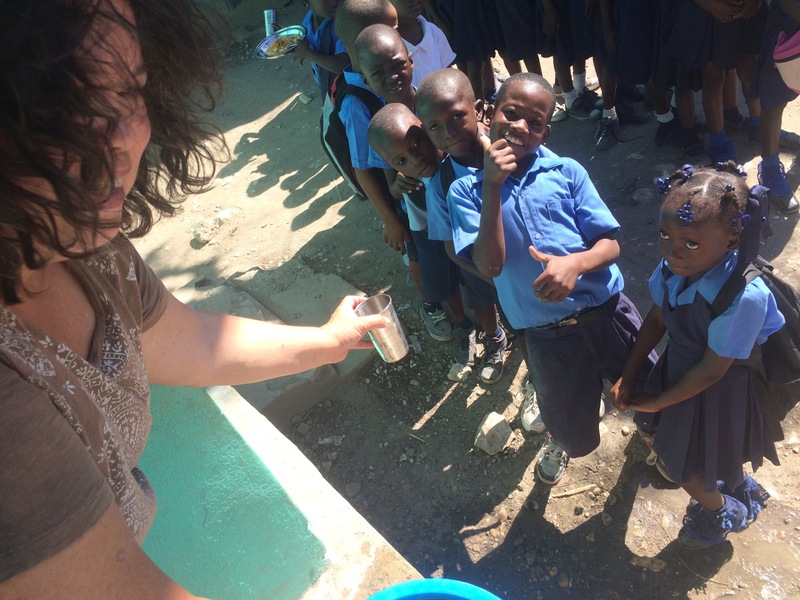 As I mentioned in the previous blog, I’ll be sharing about some of the ministries I have been able to be a part of as being a missionary in Haiti. The first one i’m going to talk about is actually a ministry within all the other ministries we do in Haiti… If that makes any sense. Let me explain: My sister, my friends Alex and Kacey, and I are in a worship band called Innovation. Now, I’m not going to explain how our band formed because that’s a whole other story in itself, just understand we’re all in a band together. 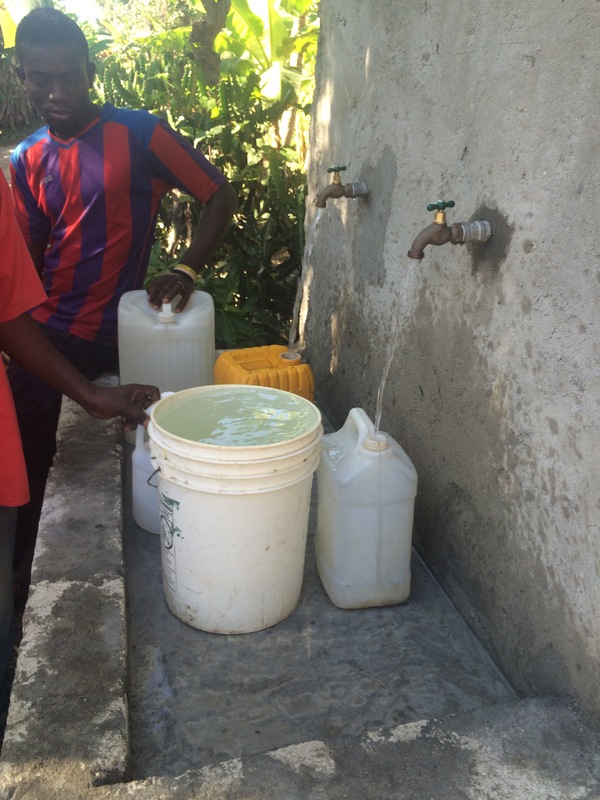 In the past few years, God has opened a huge door for Innovation to serve in Haiti. 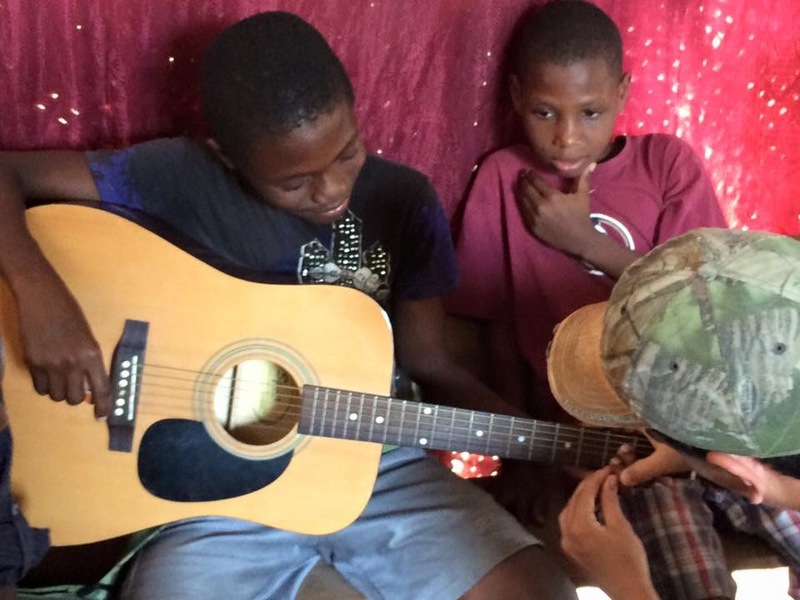 Since our band is an acoustic band (Alex- lead singer, acoustic guitar; Me- back-up singer, acoustic guitar, piano, & ukulele; Ashley- cello; Kacey- Djembe and Cajon), this allows us to bring our instruments to Haiti. We’ve taken our instruments up mountains, through rice fields, on motorcycles (yes, Ashley held the cello while riding a moto), and on a little sailboat to an island off of of Haiti. So, our instruments have been through a lot. 🙂 We’ve had opportunities to play for people in their homes, at hospitals, at the prayer house, at mountain churches, and we’ve also had opportunities to perform concerts with other Haitian choirs. Music has been such an awesome ministry. 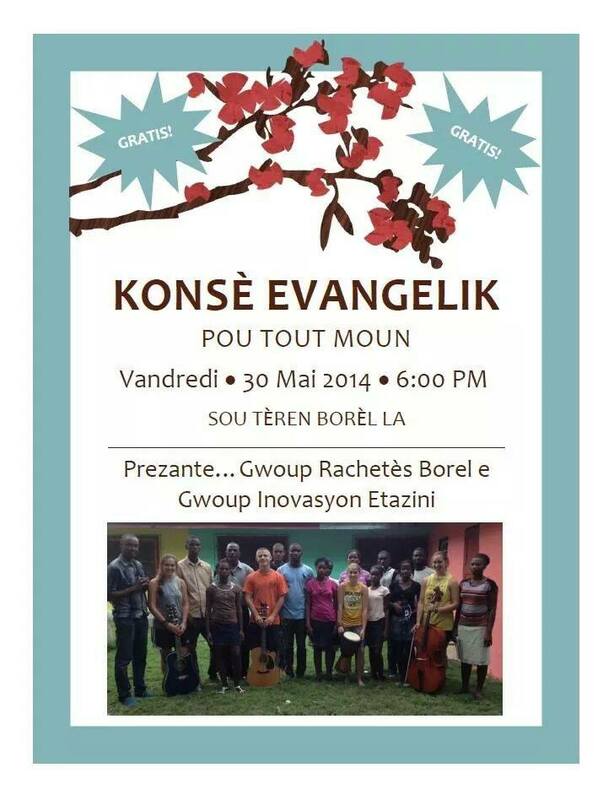 It’s amazing to see how God can use music to speak to people when you are unable to because of the language barrier. One instance where I saw God break the language barrier through music was on one of our regular visits to the prayer house. 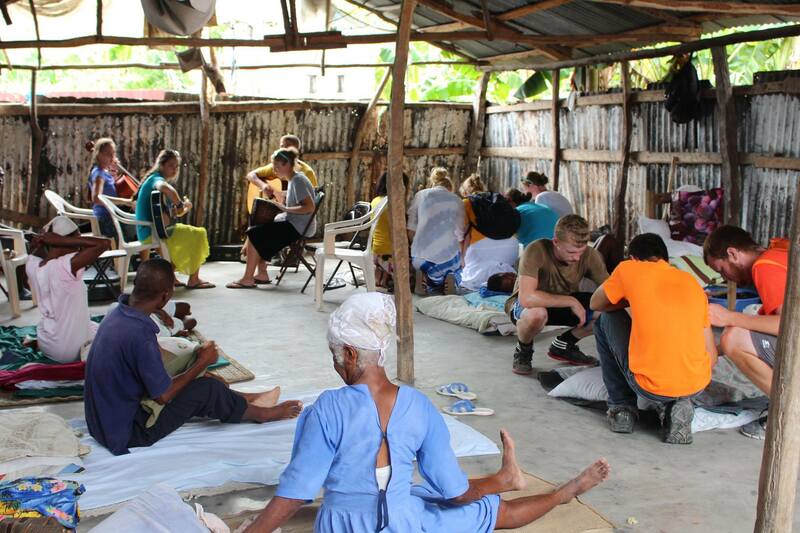 We started our visit by kneeling down and praying for each person in the prayer house, and then we all sat in the middle of the hut and played some worship songs. After a long time of playing songs and sweating to death (It’s like a bajillion degrees in the prayer house), my mom asked if I would play a guitar instrumental that I had been working on. It was to the hymn “Nothing but the Blood”. So, everyone sat there and listened to me play this instrumental (no pressure :|). I went through about a verse and a chorus, then I heard a quiet voice start singing. Then another, and another, and another. Pretty soon, I looked around and all the Haitians that were packed in the prayer house were singing along in Haitian Creole! Their hands were raised in worship and they were singing their hearts out. I got “God bumps” 🙂 It was a pretty amazing experience. It’s exciting to see God take something I love and use it for ministry and for His glory! Although we’ve gone through this process about nine times now (jeez! ), the excitement never really goes away. From planning dates, buying tickets, having team info and prayer meetings, right down to the day of departure, everything is an exciting step towards going back to our second home. 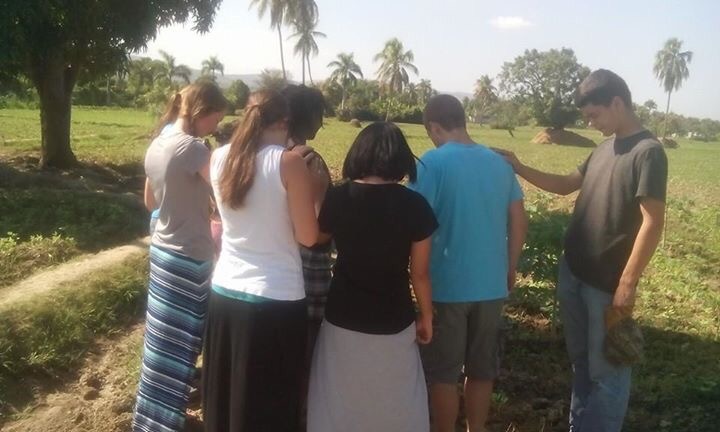 For me personally, one of the coolest things about going to Haiti is not only the mission trip itself, but also getting to see how God puts our team together. We’ve had teams of all different ages, from different states, and of different denominations. Even with all these differences, through prayer and fasting as a team, God breaks down the barriers and unites us all as the Body of Christ to be able to effectively share His love and His Gospel. Since I’ve been to Haiti quite a few times, I have a pretty decent understanding of what to expect 😉. That being said, I always love watching the “newbies” experience these things for the first time. When we tell them that there are no hot showers and we explain to them what a “tropical squirrel” is, the looks on their faces are priceless 😂. 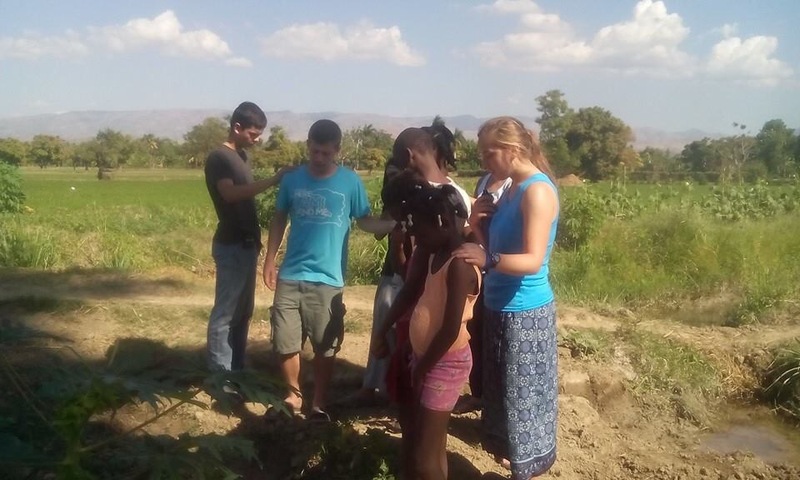 But in all seriousness, it’s amazing to watch them adapt to the Haitian culture and build relationships with the Haitian people. 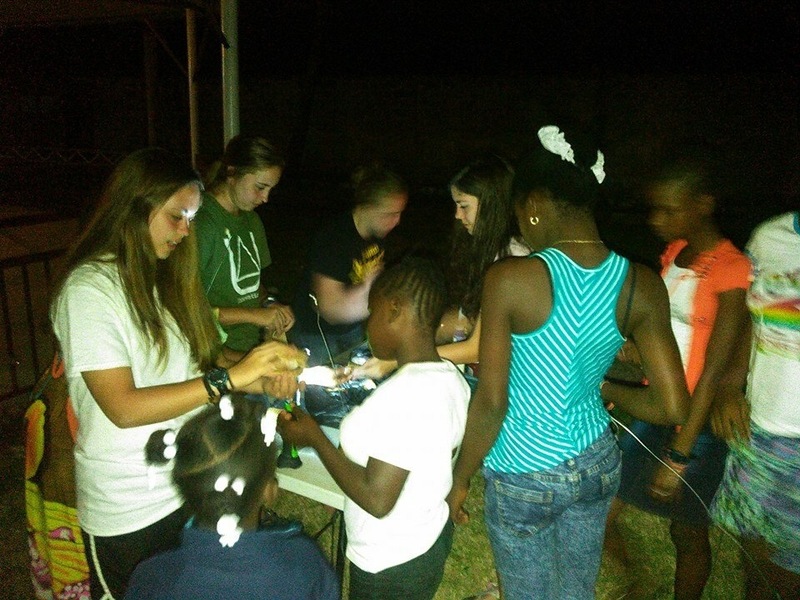 Along with building those relationships, they’re able to share the love of Jesus with the Haitians; that is hands down the coolest thing to watch. Right now, we’re at the point in our process of getting the team finalized and working on getting plane tickets. So, please keep our team in your prayers! Thanks so much! God bless! As a part-time MK (missionary “kid”) I do get to have a ” responsibility “. 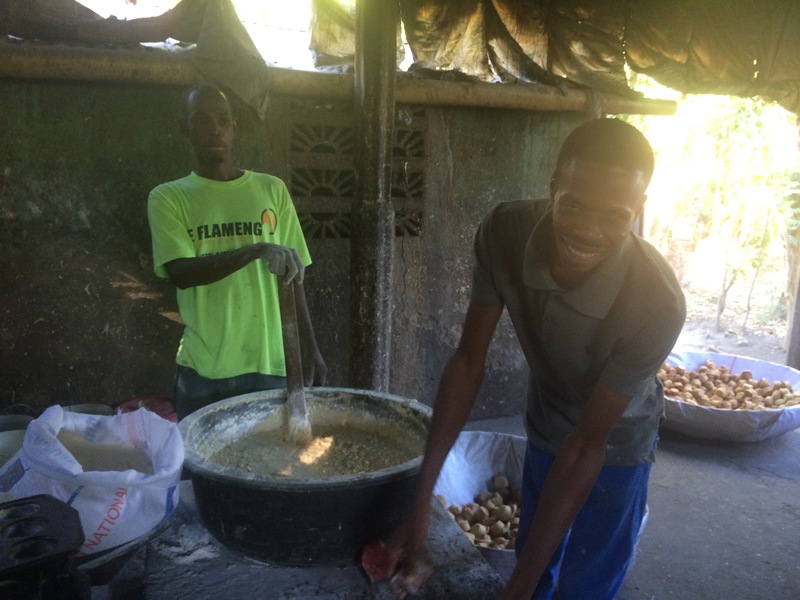 With almost every team that we work with in Haiti, there’s always a request to go visit the “muffin man”. Yes, we have a muffin man in Borel. Awesome, right? So, my job is to take the team to go see the muffin man and give him some business 😉. Hey guys! 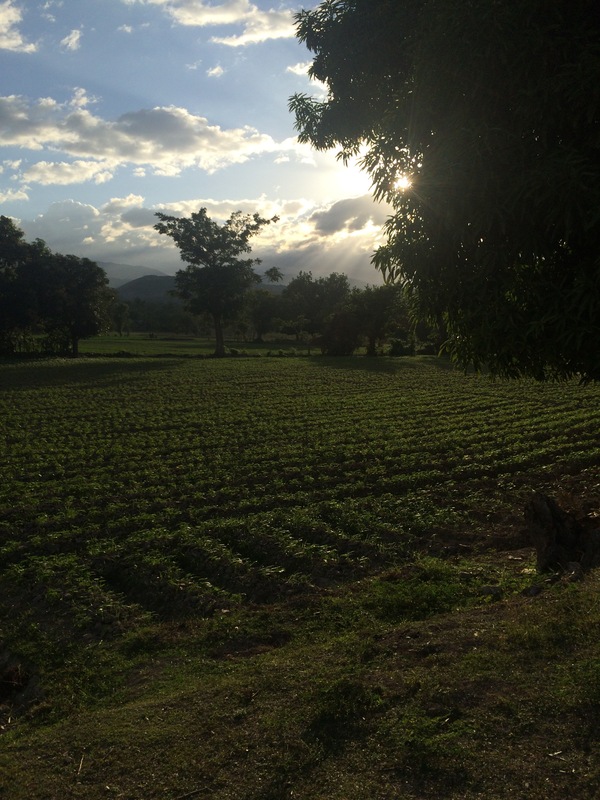 I started this blog for family and friends who would like to keep up with what God is doing through our family in Haiti. Feel free to share this blog on Facebook and such 🙂 I’ll try to post something weekly, but forgive me if I miss a week. I’m not a “professional blogger”, but I will do my best! 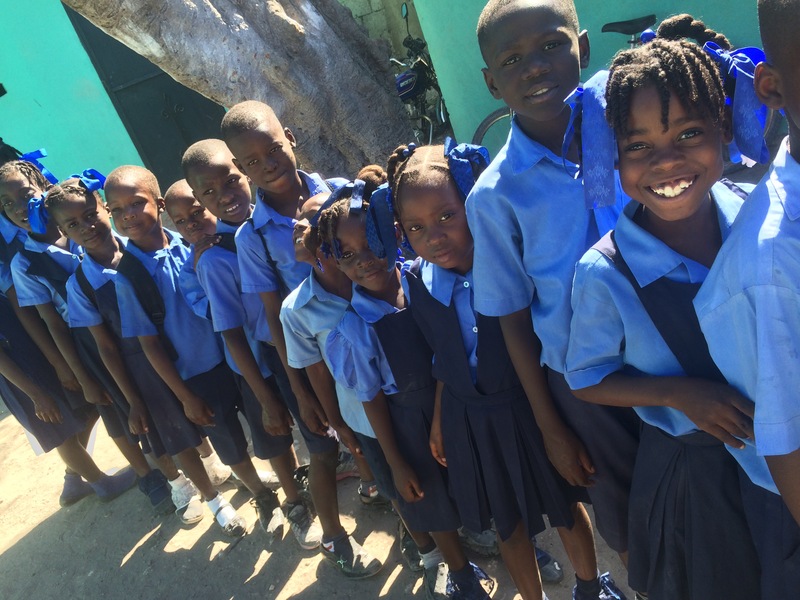 If you click on the “About us” tab and the “How to Get Involved” tab, you can read more information about what we do in Haiti. God bless! Emily Ayers on Lunch is Served! Ann Hiles on Lunch is Served! Amber on Hello from Haiti! Christy on Hello from Haiti!